The spotlight was shining on the illustrious career of the late George Jones, one of country music’s most definitive stars, as an impressive lineup of special guests performed over 50 years of timeless classics. On the night of November 22, 2013, Bridgestone Arena played host to one of the biggest musical tributes the Music City has ever seen. The night was originally booked as, and had intended to be, George Jones’ final concert of his career. Instead, the evening would be transformed into a night of celebration and an all-star tribute to the singer, who passed away in April at age 81. 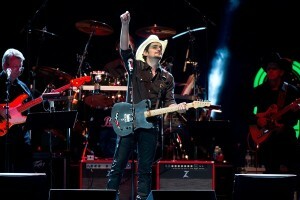 The event was cleverly billed as ‘Playin’ Possum: The Final No-Show’, a play on Jones’ nickname and reputation, and was referred to as “the largest tribute in music history” by the evening’s hosts Keith Bilbrey and Charlie Chase. The show spanned over 4-hours and included more than 112 artists performing to a sold out crowd of 16,000. 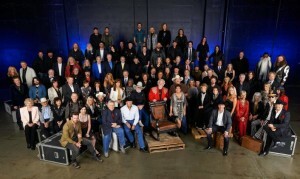 Artists paying tribute to Jones’ legacy included Alan Jackson, Big & Rich, Blake Shelton, Brad Paisley, Charlie Daniels, Dierks Bentley, Emmylou Harris, Eric Church, George Strait, Greg Bates, Gretchen Wilson, Jamey Johnson, Josh Turner, Kid Rock, Lee Ann Womack, Martina McBride, Miranda Lambert, Montgomery Gentry, Shooter Jennings, Stonewall Jackson, Vince Gill, and many more. Most of the night’s performers were country mega-stars, but many of the stand-out performances of the evening were from artists outside of the genre. Sam Moore, of the R&B duo Sam & Dave, sang an emotional cover of Blues Man for Jones’ widow Nancy, which brought the crowd to a standing ovation. There was also a duet between heavy metal guitarist Dave Mustaine and country music artist Jamey Johnson that proved to be a unique take on Jones’ 1998 single, Wild Irish Rose. Throughout the ever-changing lineup of artists that evening, there remained a singular presence on stage reminding everyone why they were there: a single rocking chair with Jones’ logo sat stage right, bathing in a white spotlight. The night was a spectacular marathon of incredible performances and celebration. 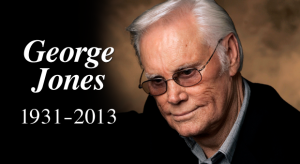 Once recognized as the “greatest living country singer”, George Jones represented everything about country music. He was loved by fellow musicians, producers, and songwriters alike, and will always be remembered.